Transfection Products, In Vivo Transfection Reagents, 100+ Cell Line Optimized Transfection KitsTissue-targeted in vivo transfection reagents and over 100 pre-optimized transfection kits for individual cell lines and primary cells. Transfection products are manufactured by Altogen Biosystems. Transfection is the use of chemical (liposomes, chemicals) or mechanical (electroporation) means to transfer nucleic acids into cells in order to alter mRNA expression or the genetic makeup of a genome (i.e. 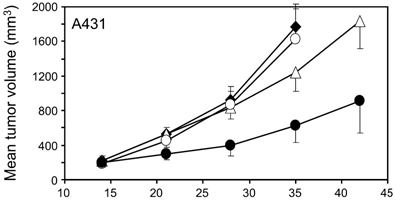 stable expression of exogenous genes or gene knockout). Transfection is used to develop genetic therapies for diseases such as obesity, AIDS, cancer and cardiac issues. Gene silencing (called RNA interference or RNAi) is a technique through which the expression levels of a gene are turned off or knocked down. Typically consisting of a 20-25 base nucleotide sequence of double stranded RNA (dsRNA), siRNA is extensively used in RNAi studies. Although a gene may be silenced at either the transcriptional or post-transcriptional stages, RNAi is specifically a post-transcriptional gene silencing mechanism achieved by transfecting a dsRNA into a cell. Non-viral delivery of DNA or RNA requires a transfection reagent or transfection method with multi-faceted capabilities. Attributes of a good transfection reagent include protecting the payload from harsh environments that can lead to degradation from RNases and DNases by forming a tight bilayer (hydrophobic exterior, hydrophilic interior). A successful transfection reagent also readily loads with a high ratio of active pharmaceutical ingredient (API) to delivery agent ratio. This ultimately leads to lower manufacturing costs of the transfection reagent since lower concentrations can be used per test sample. Perhaps the most crucial aspect of a transfection reagent is size. With an understanding of cellular pore size and an extensive innate response to foreign material in an organism, transfection reagents must have final structure sizes that can bypass mechanisms that trigger immune responses. Optimal transfection reagent compound size should fall in a range of 50-400 nm. Chemical transfection is the uptake of a test reagent either through the liposome binding to the cell membrane, endocytosis or interaction with a cell surface marker. Mechanical transfection is the physical movement of proteins or nucleic acids into the cell, via electrical current. Other methods exist, such as viral delivery of DNA into cells (termed transduction). A similar process to transduction of delivering plasmid DNA into bacteria or non-animal eukaryotic cells is called transformation. Transfection is used to describe transferring a purified protein or nucleic acid (DNA, siRNA or miRNA) into mammalian, eukaryotic cells. Whether it is by chemical or mechanical transfection, the idea of transfection is to create an opening in the cell membrane to allow exogenous genetic material to pass into the cytoplasm. The design of the transfection delivery reagent determines the destination of the payload (siRNA, miRNA, plasmid DNA). The delivered payload either remains in the cytoplasm for transcriptional regulation or continues to the nucleus for integration into the genomic DNA and stable expression of the payload (plasmid DNA). Transfection is used to deliver nucleic acids to cells in the creation of transgenic mouse models, genetically modified plants and even genetically modified pets. Manipulation of gene expression by transfection of cultured cells enables a fully controlled, clean environment for the study of apoptosis, cell cycle, target gene expression and mechanism of action. There is a vast array of in vitro transfection reagents available on the market that is specific to the researchers’ needs. Although cell culture studies do not require a transfection reagent to protect the payload from the harsh environment of circulation in animals, it must provide protection from degrading factors in cell culture medium and FBS (i.e. DNases and RNases). Liposomes are small capsules made of polymers similar to those that make up the cellular membrane. When formulated with nucleic acids, lipid transfection reagents engage with the cell membrane and release their cargo into the cells. Lipid based transfection reagents utilize the semi-permeable feature of cell membranes to transport nucleic acid molecules to the interior of a cell. The transfection complexes overcome the cell membrane by endocytosis and the nucleic acids are released into cytoplasm. Cells that remain difficult to transfect using lipid based reagents are often transfected via electroporation. Electroporation is the use of electrical pulses to permeabilize (form small pores) in a cell membrane. Along with pore formation, the transfection by electroporation electrical pulse physically moves nucleic acid (siRNA, miRNA, DNA) with the current and by chance, forces it into a cell’s cytoplasm. This is a physical means to transfect a cell and is highly toxic; thus, electroporation buffers are available that provide a healing environment to lessen the transfection effect. 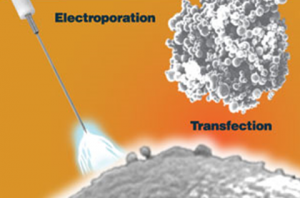 Electroporation is more effective than liposome or chemical transfection, especially in hard to transfect cells. The downside of electroporation is that it is more toxic and requires careful handling of the cells in combination with special healing buffers. The success of the electroporation experiment depends on various factors such as pulse voltage, pulse length and pulse type (i.e. square or decay). Electroporation is very successful in conducting transformation and transfection experiments and is versatile enough to be used to transfect/transform most types of cell lines and primary cells. Exogenous nucleic acids delivered by transfection in an animal can be categorized in two ways, dependent on delivery of the payload to be specific or broad. Delivery to specific cells or organs is termed a “tissue-targeted” transfection reagent, whereas non-specific payload delivery is termed a “broad range” transfection delivery reagent. The differences in these two types of delivery is related to moieties and design of the transfection reagent. Broad delivery is a result of a transfection reagent fusing with the cells lipid bilayer in a non-specific matter. On the other hand, targeting cell surface markers using conjugates leads to transfection reagent cell specific delivery of the payload. In a typical animal study, resection of tissues allow the researcher to view the efficacy and global biodistribution of their test compound. Tissue samples are collected for gene quantitation (i.e. qPCR or western blot). qRT-PCR assays can be designed to detect delivery of the active pharmaceutical ingredient (API) to tissues throughout the animal. However, delivery to a tissue does not mean the delivered API is an active molecule; therefore, changes in target gene expression are examined to determine functional activity of the test article. Due to the harsh environment in circulation, the nucleic acid cargo must be protected from clearance and degradation by the delivery agent, along with not triggering an immune response. As with any well designed experiment, positive, negative and non-treated controls need to be included in a transfection study design. Whether looking at expression knockdown of multiple gene targets using miRNA, or focusing on a single target such as luciferase expression, the appropriate transfection controls are needed. The use of controls must be included whether you use a lipid transfection reagent or electroporation. Transfection positive controls typically consist of siRNAs designed against gene targets that are known to be ubiquitously expressed, cell phenotype or viability is not effected by silencing the positive control, the gene is easily targeted and the resultant data typically exhibits a large decrease in expression upon treatment. Positive control siRNAs used in transfections include gene targets such as GAPDH, KIF11, Lamin A/C or PPIA. The results of the transfected positive control siRNA tell the researcher the system works, it aids the researcher in understanding any intra- and inter-experimental differences, the transfection reagent is able to deliver the payload to the cells and the end-point readout exhibits a quantitative signal that is significantly separated from the non-treated or negative control sample. Transfection negative controls are nucleic acids that are similar in length and structure to the siRNA being tested. However, the negative control siRNA sequence is designed such that it is not complimentary to any known genes (commonly called an alien sequence), and the design mimics the test article in length, G/C content and modifications. Negative controls are used for differentiating sequence-specific silencing from non-specific effects. Upon transfection, the negative control siRNA does not bind to any gene targets, thus gene expression levels, cell cycle and proliferation are not altered and remain at similar levels to the non-treated sample. All negative control samples are analyzed similarly to the samples treated with the test article. Additionally, all experiments should include a non-treated control and a mock transfection (i.e. adding only the transfection reagent). The mock and scrambled control helps in understanding any experimental related toxicity when data output is compared to the non-treated sample. Stable transfection is the integration of plasmid DNA into the genome of a cell. Studies incorporating a stable cell line includes cell based assays to determine gene effect on apoptosis, overexpression of the gene insert for protein production or incorporation of a fluorescent/luminescent marker in order to track cell growth when surgically implanted in a cell line derived xenograft mouse model (CDX mouse model). The creation of a stable cell line enables the researcher to analyze long term effects of the introduced gene. Generation of a stable cell line is a two-step procedure, the first being a transfection of exogenous nucleic acids into a cell or silencing a particular gene (knockout). This event is followed by application of antibiotics to select only those cells exhibiting the desired expression; all other cells not expressing the newly inserted gene will die off due to antibiotic treatment (i.e. Puromycin).